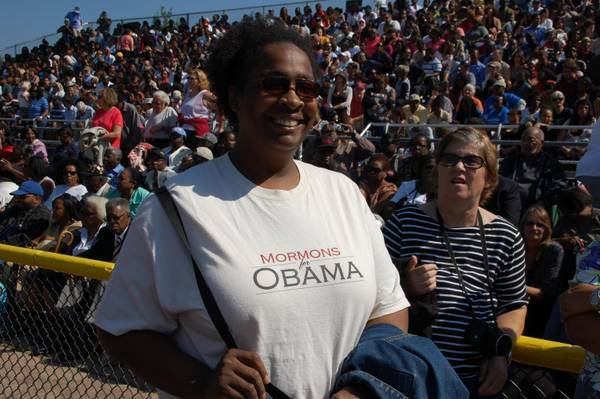 This is wonderful advice from Joanna Brooks - I also am amazed by the emails and comments that we receive on the Mormons for Obama website using similar condemnatory language. Of course, for us here this kind of thing may be a little easier to deal with because the emails are coming from strangers rather than our "friends" on Facebook. So I appreciate Joanna's comments and admonition that we try to understand Mormon Republicans and where they are coming from, and also that this goes both ways. So let each of us speak gently with our Mormon brothers and sisters during this political season, and we ask the same thing of them as well. We hope that no one would feel "out of place" in their ward congregations because of political divisiveness or something that we said, and thus we must remember to have compassion and understanding for those who may believe differently than us. Admittedly, I am also very excited to see a picture of my car on Joanna Brooks' website. This makes my car more famous than my car ever dreamed it would be. 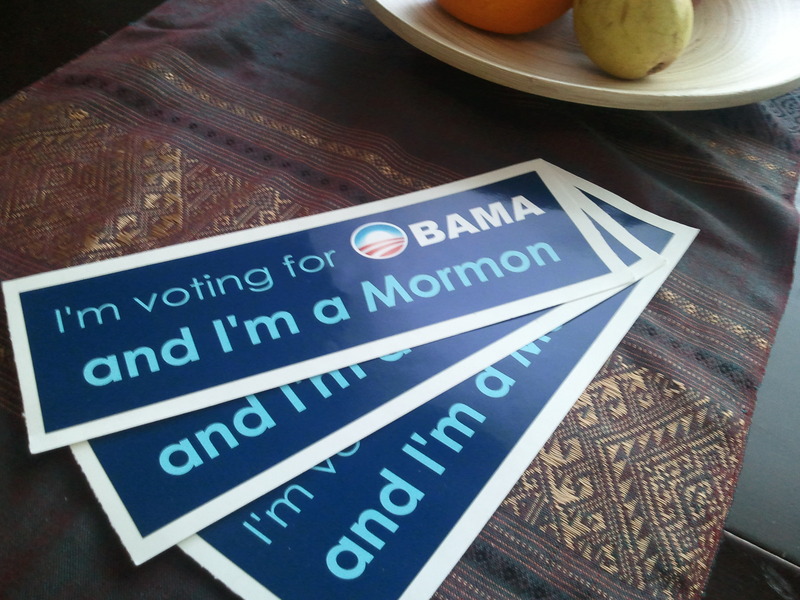 Seeing that we at Mormons for Obama are not without sin, I don't want to be the first to cast a stone at another; (so can somebody else please do it for me, and then I will surreptitiously cast the second stone?) And then there's that thing about a glass house; (is that even biblical?) Well, Buzzfeed caught wind of this and put it out there - (the media is running out of Mormon stories to run): some Romney Mormons have co-opted the "Choose the Right" slogan and slapped it underneath the Romney logo to drum up Mormon fervor for the Mormon candidate. (As if they needed to do that.) Click on this link for the Buzzfeed article. 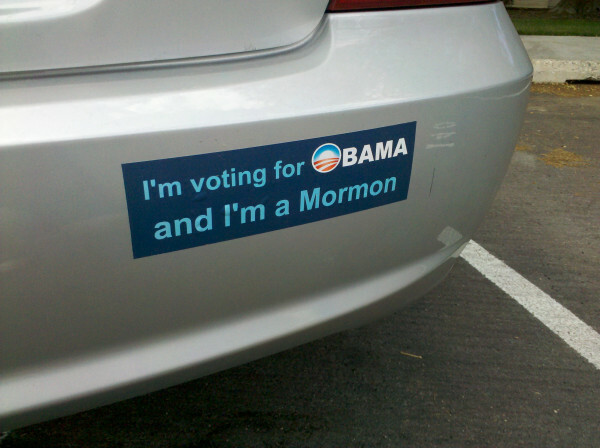 Clearly, we have riffed the "I'm a Mormon" campaign with our bumper stickers - and so legally, I can't find fault with these people too much, except to ponder, "why didn't we think of making buttons?" Although Buzzfeed does make a good point: Isn't Romney trying to distance himself from the religion discussion, and isn't this unhelpful in that regard? Forward... and my car is famous. The Obama campaign has produced a new video establishing some clear reasons for a second presidential term. I am so happy that I am on the right side of history on this one. Also, my car and its accompanying bumper sticker is now famous... check out Democratic Underground for more on this historic occasion. Here is the design - with a bigger and brighter font - (Some people said that the last one was a little hard to read from a distance on those wide Salt Lake City streets.) Just click here. Those of you that preordered: your stickers are on the way. 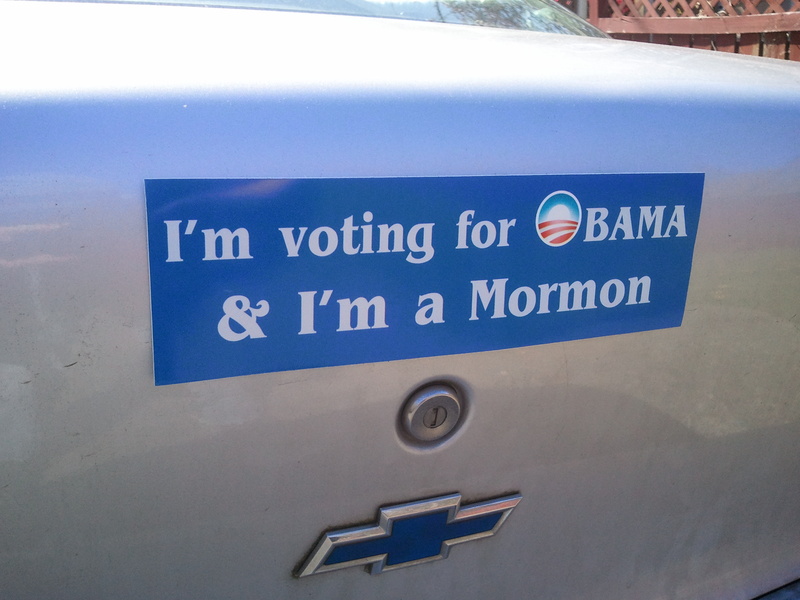 Rob posted this on the Mormons for Obama Facebook page -- in the past four years, things have changed: he upgraded his automobile to an Intrepid. This new model has a sleek design and a functional interior with an eye to the future and the real challenges ahead. That other car (a Sebring?) had too much give in the steering wheel (it could change lanes at any moment without warning!) However, it did have a nice rack on top for a dog carrier. So here we go. Orrin (Orwellian) Hatch predicts the destruction of the Mormon church by Obama and the Democrats, but seeing that I am a Democrat and support Obama, I tend to yawn and disagree. Here is a link to a short article discussing Hatch's comments and their absurdity. So order some stickers for your friends and family to show your support for the president! 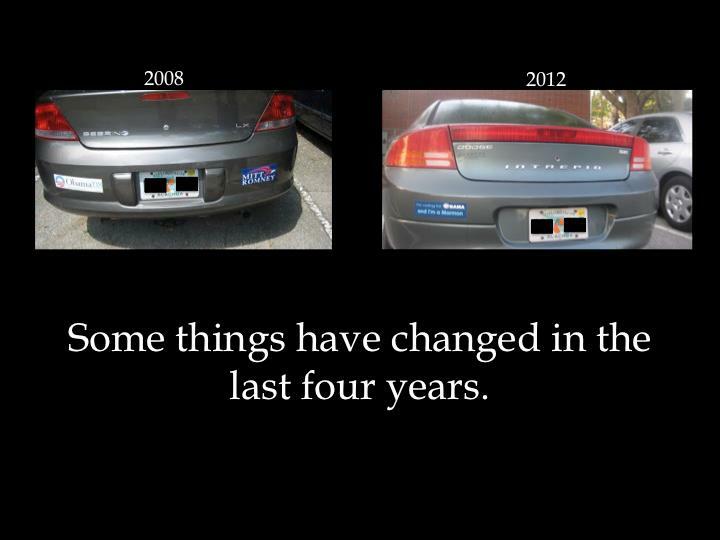 Looks like this is your last chance to get a free bumper sticker courtesy of the Obama Campaign. Dont be sad...you can always get one from us by clicking here and spending a few bucks.